Types of Dog Food: This Puppy is just as perplexed as his human parent. 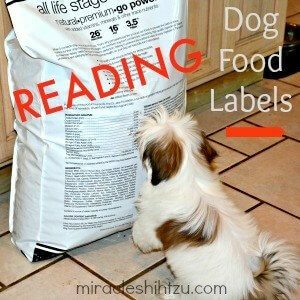 When you think about types of dog food, the first thing that comes to mind is kibble and rightly so because it is still the most popular form of food given to Shih Tzu. But, that was not always the case, and in fact, canned food was more popular in America before World War II. Now, we have a choice to purchase kibble (dry), or canned. If those were the only two options, it might be easier to feed our Shih Tzu, but unfortunately (or fortunately) we now have many other choices including dehydrated, freeze-dry, semi-moist, refrigerated, or frozen. To make it even more complicated for the average buyer, we have so many different formulas and ingredients to muddle through that choosing food for our Shih Tzu becomes more complicated than deciding on what to serve our human children. Then, there are the labels such as premium and super-premium, organic and natural. But that’s not all, raw, vegetarian, grain-free, prescription diets are also terms people encounter. When it comes to choosing raw diets, here’s a guide to find the best. Don’t forget those foods promoted for specific breeds and life stages as well as targeted at the health of a particular body system…it may make you think that it would just be easier to go with a home-made diet. What is the average consumer to think about types of dog foods? What is the average consumer to do? Feel free to skip this section if history is not your thing. In the 1800s, people fed their dogs leftovers and table scraps because the market as we know it today did not exist. In the early 1900s, several companies began offering pet foods with Milk-Bone biscuits being one of the first. Canned food was first introduced by the Chappel brothers of Illinois, and they called their product Ken-L-Ration. Shortly afterward, other companies began to offer dry foods, but these foods were only available in feed stores. In the 1930s foods began to be available in grocery stores, with the canned foods still being the most popular, and presumably most palatable type of food to feed your Shih Tzu. It wasn’t until the 1950s that Purina first used an extrusion method to prepare their dry food and called it Purina Dog Chow. Extrusion is a process where all the ingredients are mixed together, cooked, and forced through an extruder or specialized type of pressure cooker. The process results in food that is more digestible and palatable. By the latter part of the 20th century and onward, an explosion in the pet food industry provided consumers with so many choices in how they could feed their pet. Just as a comparison, in 1957, pet food sales in the US were estimated to be $350 million. In 2015, they had reached 23.05 billion. 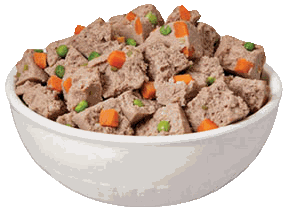 Different types of Dog Food: This one can be found in the refrigerated section of your pet store. For the purposes of this article, we will look at six different types of commercially available dog food. Click on the link or just scroll down. Dry food or kibble represents the most common type of diet provided for pets in the United States. Modern methods of preparation make this food digestible and tasty for the average Shih Tzu. Typical ingredients found in dry foods include cereal grains, meats, poultry and/or fish, milk, fats, vegetables and/or fruits, vitamin and mineral supplements and other items depending on the quality of the product. Dry foods usually have about 10% water and varying amounts of proteins and fats. This type of dog food is the most popular because they are so convenient. Dry foods are also more economical than their counterparts produced in other forms. They have a relatively long shelf life and may aid in the prevention of dental problems, although that has not been proven. Many people prefer the dry foods because they can be left out without worrying about spoilage. 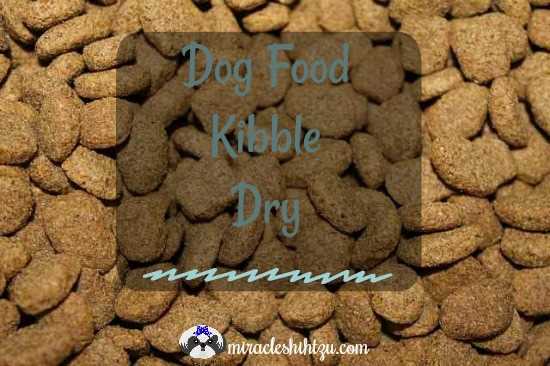 Here are a few of my favorite high quality dry dog foods. 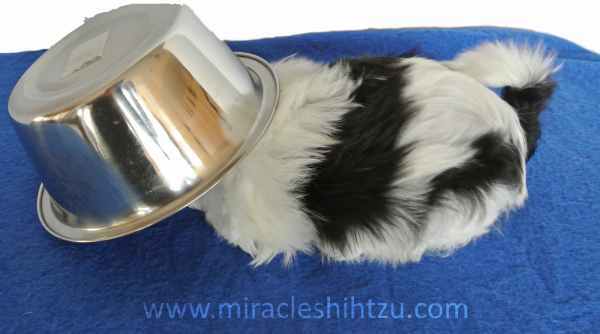 Canned foods may be an option especially for Shih Tzu that will not eat a kibble meal or for those who are ill or recuperating from an illness or surgery. This type of dog food comes in cans and the containers generally are 3, 5.5 and 13.2-ounce cans. The process of manufacturing kills any harmful bacteria, but it can also cause some nutrient loss. A quick glance at the label on a can may give you the impression that the food contains more protein and fat. It is, however, impossible to compare the nutritional values of canned versus dry food without converting each to a dry matter basis because canned food has so much more water. Shih Tzu will generally eat it because it tastes and smells great to them. Here are some excellent canned dog foods to try. When it comes to types of dog food, this group of foods usually contain between 15 to 30% water and are softer in texture than kibble, making them easier to eat for seniors or Shih Tzu with major dental problems. They have a relatively long shelf life due to the use of salt, simple sugars, glycerol or corn syrup which acts to reduce the water and prevent contamination. They also need additional preservatives to prevent yeast and mold growth. These foods were once very popular because they were less odorous and came in single serving size packets making it easy to offer their pets. They are less popular today because people are more knowledgeable of the harmful effects of artificial colors and preservatives. Most of the semi-moist foods sold now are in the form of treats because the generally have a high taste appeal to canines. Here are a couple choices for high quality dog treats. Foods found in the refrigerated section of your local pet store and now widely available in grocery stores and even discount chains such as Walmart, may be either cooked or raw. This type of dog food is quickly taking over the market due to its availability and popularity among small dogs. In most cases, the cooked varieties are prepared by using lower heat settings which reduce the chance that nutrients are lost during the process. Most contain a variety of ingredients including meats, poultry, or fish, vegetables and fruits. This type of dog food is usually high in protein and fat and low in carbohydrates. 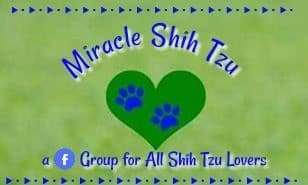 This is good news for small breed dogs, but may be too high in protein for some Shih Tzu with a particular illness, fast growing large breed puppies or giant breeds. They do have a very short shelf life which may be a drawback, but generally, Shih Tzu love the taste. Buy only what your Shih Tzu will eat in a week’s time. They also have a pleasing appearance to people, so if you are one who doesn’t like the smell of dry or canned foods, this might be a great alternative. They are more costly than dry foods, and you must purchase them regularly. Many pet foods that come in the freezer section contain raw meat that needs special handling to prevent contamination. We’ll go into greater depth about raw diets but for this page, we want to concentrate on the type of preparation needed for frozen foods. This type of dog food is becoming more and more popular in recent years and is being promoted by individuals and holistic veterinarians. As you would expect, unless you are purchasing small quantities frequently from your local pet store, you will need a large enough freezer to hold their food. Just like meat you buy for yourself, the frozen foods should stay frozen from the time it leaves the store until it is safely stored in your freezer. This means some planning and perhaps a cooler or chest with ice to keep it safe during the trip home. Frozen foods must also be safely thawed before being used, so you must get into the habit of taking out the daily portion and placing it in your refrigerator to thaw. Thawed food cannot be refrozen. Many people love the idea of providing a frozen raw diet for their pets and claim that their dog is much healthier on these diets. Just as the name suggests, this type of dog food can be raw or slightly cooked, but they all have one thing in common—the way they are processed. Drying removes moisture from the food. Foods that have the least amount of moisture will have the most nutrients available. Different temperatures are used to dry the food. If lower temperatures are used, the time required is longer, and the food can spoil. Higher temperatures (140 to 180 degrees F. Work best because anything above 180 degrees F will cook the food. Freeze-dried foods are made in the opposite way. They are exposed to low temperatures, freezing them quickly and then exposing them to high air pressure which turns the frozen water in the food to vapor. The scientific term for freeze-drying is sublimation or the process of moving a solid (ice) directly to a gas. 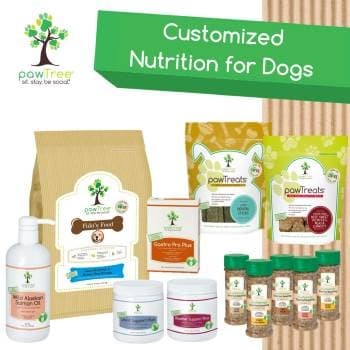 Experts suggest that the freeze-dry method does not inflict as much damage to the food as the dehydration method, so you are likely to see that this type of dog food is promoted more so than the similar product, dehydrated foods. Most owners that use these foods prefers to serve a raw diet, and this is an approach that makes raw much easier to manage. 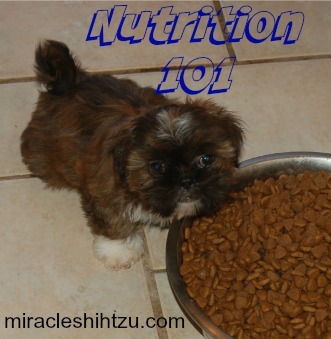 Mostly raw diet--transition to it should be slow if the Shih Tzu has never eaten a raw diet before. There is no such thing as a best dog food. 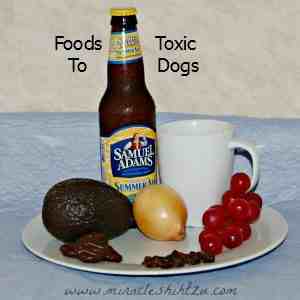 Food choices vary and what is fine for one dog may be terrible for another. 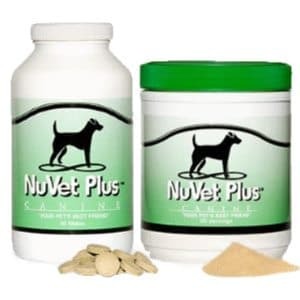 Any of the types of dog food we've listed on this page can be fine as long as you've picked a good quality, nutritious one that works well for your dog's health, age, and activity level. You must also decide what is best for you. If you gag every time you open a can of dog food, or have very limited freezer space, you can easily eliminate some of the choices. The most important decision is not so much as to the method of manufacturing, but rather, what's in the food you decide. If you found this page, Types of Dog Food helpful, you might be interested in the following recommendations.